Cut the seaweed "papers" in half, lay them shiny-side down, and put them aside for now. Open the spam container, carefully shake the can upside down (so that the contents can come out), and cut the spam into slices. It's preferably in cutting it the short way, so that you have more pieces. Fry, bake, or microwave the spam slices. Frying/baking: Stop when it turns brown or a crispy look. Microwave: Put it in for at least a minute to 1 1/2 minutes. Take a piece of the seaweed, and place it onto the cutting board vertical. Damp/wet down the musubi mold and place it in the middle of the seaweed. Scoop rice into the mold (not a lot, there's still plenty to put in there! ); you can flatten it if you want. 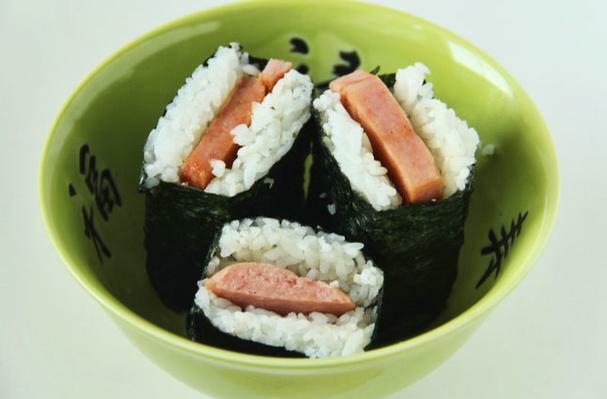 Take a piece of spam and lay it on top of the rice. Take another scoop of rice and place it on top of the spam. Wet down the flat piece of the maker and proceed to flatten the entire thing (be careful with it!). Holding down the flat piece, slowly slide the mold up and off of the musubi. Take the flat piece off afterwards, being careful of the stickiness of the rice. Take both sides of the seaweed and fold it in (like tucking a baby in a blanket). Dab some water on the edge to seal it. You can make it with only a strip about 1/3 of the rice. Enough to hold things together, but not as chewy to get through. Sorry, that was sort of incohertent. You can make Spam Musubi with a strip OF NORI only about 1/3 the width.